ISR-affiliated Assistant Professor Min Wu (ECE/UMIACS), Professor K.J. 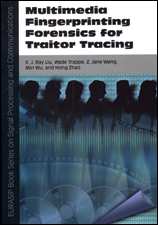 Ray Liu (ECE/ISR), and ISR alums Z. Jane Wang, Wade Trappe and Hong Zhao ( a current ISR postdoctoral researcher) have written Multimedia Fingerprinting Forensics for Traitor Tracing. This is a new book in the EURASIP series on signal processing and communications. It provides comprehensive coverage of emerging multimedia fingerprinting technology, which tracks culprits involved in the illegal manipulation and unauthorized usage of multimedia content. The book highlights challenging problems as well as future trends, providing readers with a broad view of the evolution of the young multimedia forensics field. It is written for a wide range of researchers and professionals in electrical engineering, computer science, information technologies and digital rights management. This new technology can track culprits involved in illegal manipulation and unauthorized usage of multimedia content.